The weather in the Everglades today was perfect, so we decided to head toward the Chatham river, and fish for snook and redfish. When we arrived at our first spot, the tide was falling, and the fish were on the bite . Minutes after casting out a live pilchard for bait, that we had cast netted earlier in the day, we were hooked up with a beautiful snook that measured in at 29 inches! After catching several more snook, with a few nice redfish mixed in, we decided to head offshore to a nearby wreck. While at the wreck, we had steady action, catching some nice sized mackerel and pompano. 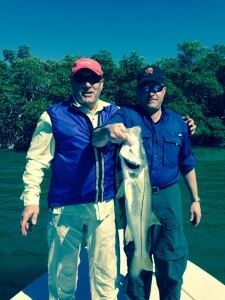 Don’t miss out on some great Everglades fishing! Give me a call, and let me get you into some great action!